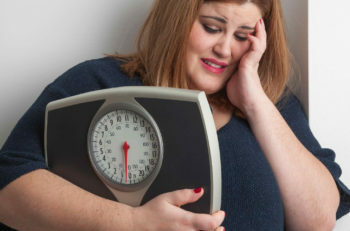 More and more research is showing how sleep disorders and weight gain are related. In another study at the University of Colorado Boulder, Dr. Kenneth Wright and colleagues found that men who were forced to sleep only five hours a night put on two pounds within one week. When people get insufficient sleep, it leads them to eat more than they actually need. Newly published research has also learned that the quality of our diets affects sleep. When we eat a healthy diet during the day, we sleep better at night. The converse is true: poor diets lead to poor sleep. Exactly how lack of sleep affects our ability to control weight has a lot to do with our hormones. Several important hormones are listed below. To sum it up: More ghrelin and less leptin equals weight gain. And weight gain, unfortunately, can lead to sleep apnea, and sleep apnea in turn can lead to more weight gain, creating a vicious cycle. Another hormone affected by sleep disorders is insulin, research has shown. When we don’t sleep well our cells resist, or block, insulin’s efforts to ferry glucose into our cells. Yes, it’s as if sleep deprivation is making us diabetic. There’s more bad news. Insulin promotes the release of leptin, the “stop eating” hormone, so when we’re sleep deprived and our cells are rejecting insulin our bodies make less leptin. This leads to more eating, and more weight gain. A good night’s sleep can help hormonal disturbances. No longer is your body fighting against you. Losing weight gets easier. Plus, a good night’s sleep lessens fatigue, so you’re more likely to exercise, which certainly promotes weight loss. If you are concerned about weight gain and if sleep is keeping you from your weight loss goals, please call us today or contact us via the short form below. Excellhealth Sleep Center offers comprehensive sleep care by board certified sleep specialists for patients in and around Johnson County, Kansas including Overland Park, Lenexa, Olathe, Leawood and Shawnee Mission. We provide inpatient sleep consultations at Shawnee Mission Medical Center, as well as sleep studies and home sleep testing in partnership with an AASM accredited sleep lab.